You might well be wondering how river-cruise ships seem to scarcely change in size, yet are managing to squeeze in larger cabins, more restaurants and accommodation for more staff – right down to private butlers on some lines. Avalon Tapestry in Central Europe. The main preoccupation for naval tech-heads in river-ship design over the last few years has been to increase space on board ships to allow larger cabins and public areas, as well as an improvement in luxury features and service. But in Europe, space must result from clever design, since increases in size are limited by low, medieval bridges and the narrow river locks that passengers so enjoy transiting. In 2006, Avalon Waterways took a novel approach and moved the navigational bridge of its new Avalon Tapestry behind the passenger section. 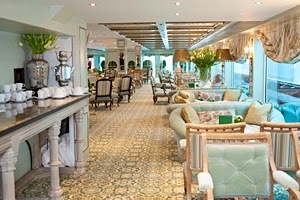 The result was a more spacious interior and the relocation of lounge and dining areas to the front of the ship for open views of the river. When Scenic Tours launched its new-generation Space-Ship in 2008, it became the longest river-cruise ship in Europe at 135 metres. A pioneering double-hull design gives it safety below the waterline. Above, more space means larger suites with full-size balconies (where once French balconies had been the limit) and an alternative fine-dining restaurant. More space also means more crew: top-deck cabins now offer butler service. The spacious interior of Uniworld's Antoinette. Uniworld’s new Antoinette had another space-enhancing first. Stateroom balconies can now become entirely enclosed by lowering floor-to-ceiling windows, allowing a conservatory-type extension to the cabin. Avalon Panorama adopted a similar feature in some of its staterooms. More recently, more flexibility has been added in the use of existing space. Thanks to retractable floor-to-ceiling windows, Viking’s lounges on its Longships now become outdoor decks. Scenic Cruises has spent $10 million on refurbishing its ships for 2014: cabins have sunrooms that can be transformed to open balconies at the buzz of a button. Cabins on some ships are becoming bigger simply by reducing passenger numbers. Tauck’s new Inspiration-class Inspire and Savor are 23 per cent longer than its existing ships but carry only 10 per cent more passengers. They’ll each have 130 guests aboard, where similar-sized ships might carry 190. There will also be 57 per cent more suites (instead of smaller staterooms) than on its existing Jewel-class ships; the new suites have walk-in wardrobes, French balconies and marble bathrooms with double vanities. Want to know more about the latest trends in river-cruising? If you’ve missed previous posts on the topic, click on TRENDS & UPDATES in the labels list on the right for more. Leave a comment if you feel you have something to add. Our readers appreciate your feedback.